TOKYO -- Toyota is plunging into the electric vehicle race with plans to roll out more than 10 EVs worldwide by the early 2020s. Toyota, which currently doesn’t offer a single EV nameplate, said it would introduce the first EV in China and then gradually introduce them in Japan, India, the U.S. and Europe. Under the plan unveiled Monday in Japan, Toyota said it will sell more than 10 BEVs (battery-powered models) worldwide by the early 2020s and electrified versions of every model in the Toyota and Lexus lineups by 2025, with plans to sell some 5.5 million traditional gasoline-electric hybrids, plug-in hybrids, EVs and hydrogen fuel cell vehicles by 2030. By then, Toyota said it expects to sell 1 million EVs or fuel cell vehicles alone a year. The bold goals mark a major departure for Japan’s biggest automaker, which has long favored its trademark gasoline-electric hybrid technology over purely battery-powered systems. The blitz of at least 10 new EVs suddenly vaults Toyota to the forefront of the race among Japanese automakers, including EV pioneer Nissan. Nissan, which introduced the Leaf EV in 2010, has yet to disclose plans for an expanded lineup of EVs -- although with its alliance partners, Renault and Mitsubishi, Nissan aims to introduce 12 new zero-emissions vehicles by 2022. Honda, a longtime EV skeptic, has disclosed plans only for a EV in China beginning next year and another EV slotted for European showrooms in 2019. Toyota had long argued that limited driving range, high costs and slow charging times would relegate EVs to a niche segment. But Toyota has changed gears as governments in China, Europe, India and elsewhere consider new regulations mandating eco-friendly vehicles to stem harmful emissions and pollution. Toyota expects a battery breakthrough to help it overcome some of the technological challenges, including energy density, cost and weight. The carmaker says it aims to commercialize next-generation, solid-state batteries in the early 2020s. Toyota added that it will also redouble its focus on creating an infrastructure conducive to widespread EV use. That includes battery recycling and charging stations. In a sign of the new shift, Toyota said in September it would form a joint venture with Mazda and supplier Denso to co-develop an architecture for EVs. Subaru and Suzuki are among other automakers that may join the project. And earlier this month, Toyota agreed with Japanese electronics giant Panasonic to jointly study development of high-performance batteries that can jumpstart EV demand. Toyota’s broad foray into EVs comes a month after it sounded a dire warning about the rapidly changing auto industry. 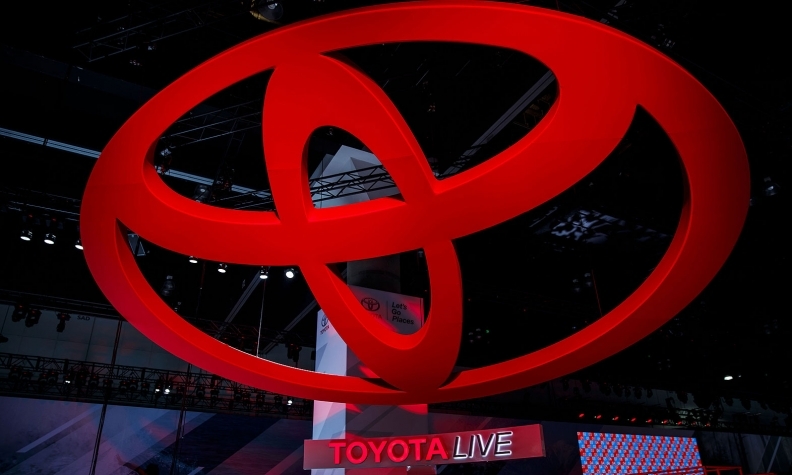 Citing the crush of demands for electrification, autonomous driving, and connectivity, Toyota said it faces a “now or never” competition “about surviving or dying” in the new era. Toyota had been a notable EV skeptic since 2014, when it pulled the plug on a two-year deal to build electric Toyota RAV4 crossovers with Tesla Motors. That same year, it finished deliveries of its other recent EV gambit, the small eQ, a battery-driven car based on the Scion iQ three-seater. Commitment to that car always had been halfhearted. In 2010, when Toyota announced the eQ, the company predicted it would be selling thousands. But by 2012, Toyota said it would sell only about 100 in the U.S. and Japan. But Toyota is eager to dispel any notion it trails in the EV race, even though overseas rivals such as Volkswagen hatched earlier sweeping electrification plans. Toyota executives routinely stress that the company has a lengthy history in electrified vehicles -- if hybrids are thrown into the mix. Indeed, the Prius debuted in December 1997. Some 20 years later, Toyota has sold more than 11 million gasoline-electric hybrids. All that experience in battery, motor and control unit development gives Toyota a head-start in ramping up EVs whenever demand picks up for real, Toyota says. Hybrids, such as the flagship Prius, are called hybrid electric vehicles, plug-ins are plug-in hybrid electric vehicles and hydrogen cars are dubbed fuel cell electric vehicles. Toyota, which remains committed to hydrogen powered vehicles as part of the strategy, said it would expand its fuel cell lineup for both passenger and commercial vehicles in the 2020s.